Electric and Hybrid vehicle’s are coming of age, particularly for city dwellers who take short daily commutes. If you average less than 25 miles, and charge the 2019 Ford Fusion Energi at home and work, changes are you’ll spend very little on gas. The 2019 Ford Fusion Energi, which is powered by hybrid, electric and fuel energy, has increased its electric range from 21 to 25 miles and it’s fuel range averages up to 42 mpg. Which means that, depending on your driving style, you can make short trips primarily on electric power. Although Ford led the industry by introducing the first hybrid vehicle, the Toyota Prius became the top selling plug-in hybrid in the U.S. 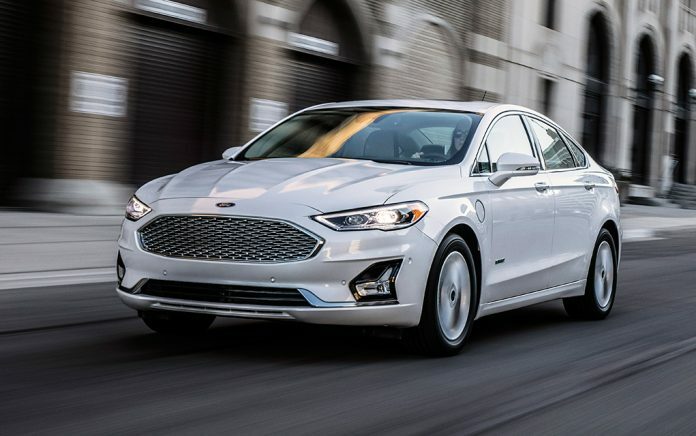 However, the 2019 Ford Fusion Energi Plug-in hybrid is trying to catch up to some of its competitors that offer better fuel and battery mileage. Ford managed to maintain the same battery size, while increasing its output from 7.6 to 9.0 kWh. Other competitors include the Chevrolet Volt, Hyundai Sonata Plug-in hybrid, Honda Clarity Plug-in, Kia Optima Plug-in, and others. The engine is so quiet that it’s easy to forget that it’s running. I drove it around for a week in the hybrid mode and never had to stop for gas or plug it in. The trip summary gauge in Ford hybrids display the overall mpg, trip mpg and fuel levels. It also shows you trip information, and awards “leaves” of credit if you drive economically. The more battery power you generate, the more leaves you receive. Eventually, by paying attention, you may learn to drive more economically. The Ford Fusion also has a rotary dial shifter with a hill descent function that will hold the car on a hill without the need for unnecessary braking. The Fusion models come in the SE, SEL, Titanium and the Energi. The base hybrid models start around $26,000 and goes up to $41,695 for the Fusion Platinum Energi.